Robur’s range of Eurograde deposit safes are an ideal solution for businesses with a large daily turnover of cash or where items or papers need to be quickly secured. Thanks to the drawer deposit mechanism, cash and valuables can be stowed in the safe without opening the main door. This keeps previous deposits secure and also means staff cannot be forced to open the safe under duress. 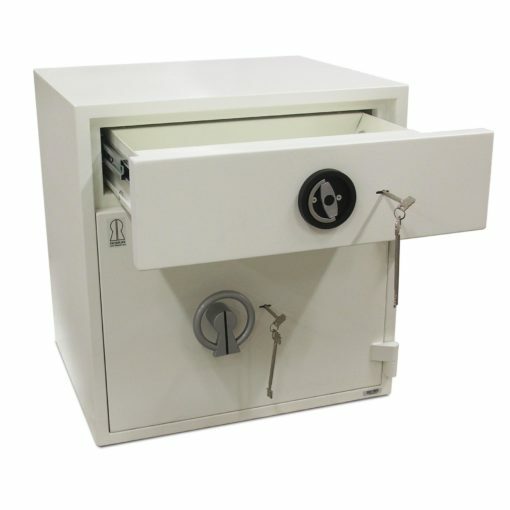 The drawer and door use different keys, so access to the safe can be restricted to trusted personnel. Tested and certified by the Swedish SBSC laboratory, Robur Deposit Safes are rated Grade I under the EN 1143-2 burglar resistance standard. This means the safe and its deposit mechanism have been stringently examined to make sure they can fend off typical attempts at safe breaking using tools such as hammers and blowtorches. The deposit mechanism is also tested to ensure items cannot be “fished” from the safe. This highly secure deposit drawer is also highly spacious, boasting internal dimensions of 104Hx517Wx124D. 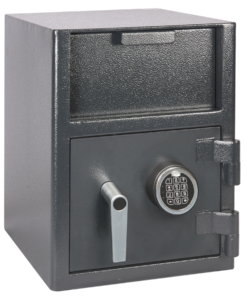 Robustly constructed, these deposit safes feature Robur’s uniquely designed turn wheel handle. Strong locking bolts secure the door. Key locking is standard, while digital locks are available as an optional extra. A range of sizes are available, with even the smallest model providing a generous storage capacity.